1. Refresh 100% starter to yield +200 grams for the next morning. Overnight room temps can be 60F. Use 50 gm whole wheat, 50 gm AP, 100 gm H2O and 30 gm natural leaven at 100% hydration. 2. Pour 600 gm boiling H2O over 300 gm steel cut oats in a pot or bowl with a lid or cover. Stir the oats once and cover. Let steep 45 minutes. 3. (45 minutes later) Pour the steel cut oats and associated water into a large sieve set over a bowl. Let drain about 30 minutes but capture and reserve the water. After 10 minutes use the accumulated water. 4. Into your bulk dough bowl, add the oat water and enough other water to yield 650 gm. 5. Add to the bulk dough water, 200 gm starter and whisk to incorporate. 6. In a small bowl add 50 gm of remaining oat drainage water (add more water if necessary) to 25 gm kosher salt. Set aside. 7. Add 1 kg AP flour to water and starter in bulk dough bowl. Mix by hand or on a work surface until all flour is moistened. Dough may be rather stiff. 8. Let dough autolyse for 30 minutes. 9. Add salt and associated water to dough by hand. When the salt-water is incorporated, do a set of stretch and folds. Return to bowl and let rest 30 minutes. Do another set of stretch and folds. Let rest 30 minutes. 11. Turn the dough out on to a lightly floured surface. Divide in half. Form into balls and let rest 15 minutes. Shape into logs (for oval loaves) or rounds (for boules) depending on whether you are baking in round or oval dutch ovens (or oval Romertopfs , as I do). Roll smooth (non-seam) surface of shaped doughs into rolled oats to cover the surface and place seam side up into appropriately shaped forms. Let proof about 1hr 30 minutes at 70F. 12. At the 1 hr, 30 minute mark, place dutch ovens into oven and preheat to 500F for about 30 minutes. Remove dutch ovens, turn loaves out onto dusted work surface, score, place into dutch ovens, cover and place in the oven. Lower oven temp to 475F and bake 30 minutes. Remove dutch oven covers and bake for 25-30 minutes uncovered at 450F. Let cool completely. While they can be eaten as soon as completely cooled, the loaves will hold perfectly, uncut, 1-2 days as the moisture from the steel-cut oats permeates the crumb. An absolutely beautiful loaf, I can't wait to try this! Thanks for posting the formula. Oooo... So nice! Would you mind if I featured this on the homepage for a bit? Tried this recipe twice. First time dough was so lose it couldn't hold shape to form a boule. The second time I added up to 1 cup additional flour, It was still too loose. I did use bread flour instead of AP flour. Is the posted recipe correct? Any assistance would be appreciated. I was able to bake as a batter type and the taste and texture was great. The trick to this recipe is to get the oats soaked properly, not how much flour you add or what type (AP or bread flour). Try it one more time and shorten the soak to 15 minutes. You soak the steel-cut oats just to soften them so that you don't break a tooth on them. Most of the water you use to soak the oats should drain off to be a major part of the 650 grams of water added to the dough. The steel-cut oats should have the texture of a soft nut. Oat Soaker Not Working For Me! Has anyone had success with this recipe? I followed the instructions pretty exactly for soaking the oats ie 300g oatmeal (UK term for steel cut). It was a mix of coarse oatmeal and medium. Put the 600g boiling water on, it became a pretty solid lumpy mass, more or less straight away. Had to use a Danish whisk to get rid of the lumps. Drained after 45mins, but drainings = about 20ml! So, like others, ended up with a very wet dough. I'm thinking maybe the water should be hotish but NOT boiling, so the oats don't gelatinise as much. Oats are one of my favorite add-ins. I even mill oat groats into flour and add small amounts to some loaves. I'll be trying this soon, thanks for sharing. This one deserves front page status! What a beautiful loaf, well done!! I haven't yet ventured into sourdough (my most recent attempt at a started failed). Can I make this with just an overnight 100% preferement using commercial yeast? Should be easy to use yeast. For guidance look at Forkish's Flour, Water, Salt, Yeast. Most of the recipes that I develop are based on the 1 kilogram flour structure that Forkish and Robertson use. Forkish has a lot of yeast-based ones. So far I've only done oats on the outside of my bread. Think I will give this one a shot. Thanks for posting! That's a beautiful loaf of bread. How did it taste and what are you using it for? I think I'll give this a go using my oat groats milled on a very coarse setting. It just looks like it will be so good with butter. I wanted an oat flavor but with the toothiness of a cracked wheat and I nailed it. The steel-cut oats softened just enough to be edible but retained their shape and character. It is indeed is good on its own with butter and it is great with a nutty cheese and subtle cream soup ( last night's dinner ). Makes terrific toast and I also had it as a ham and gruyere sandwich. I would not use it with a strong flavored soup or stew as its own flavor is mild and needs to stand on its own. You could do the Scottish (oats) thing too and have it with smoked salmon. Would also be great with mild onion and veggies and mayo. I made a few edits to the above recipe. The goal is to get the steel-cut oats just soft enough to chew. PJ, does that edit change how wet the dough is? I made this yesterday, before I saw the edit, and it was a very wet, slack dough. There was no rolling in oats. Dabbing, as it spilled out of my hands, perhaps, but I didn't roll, I just sprinkled them over. Also, I wasn't ready to bake when I thought I would be, and we had to go out for dinner, so I put my boules in the fridge overnight, baked them this morning after letting them sit on the table for an hour or two. The first one is really good. The second one is still in the oven. Thanks for the recipe though, I'll definitely try it again with the change in soak time. The change in soak time does make the dough less wet. The challenge is to sufficiently soften the steel cut oats so they are chewable but not so much that they absorb too much extra water. If you soak them sufficiently but minimally you should get at least 300 gm water back when you drain the oats. I was getting about that much in the initial drain and then another 50 gm after a longer drain. I used the other 50 to mix with the salt. The other challenge is to both time this within the other processes of the recipe and describe it accurately. The new edit is not as simple but does work more reliably. Hope that's clear. David ... the goal is to get the steel cut oats just barely tender and to reserve the starchy water from them for the dough. The pressure cooker will obliterate them ... IMHO. A pressure cooker shouldn't obliterate anything unless one cooks it too long. It's just that the time to obliteration is shortened, sometimes considerably! Thanks for posting this loaf. I frequently bake loaves with cracked wheat and some of my favorite loaves to bake are ones with oats that have been cooked into an oatmeal porridge. I just never had the idea to use oats in a scald the way you did with your loaf so last night I mixed up a dough but couldn't resist tweaking a bit….actually quite a bit. I grind my own grains and my mills will grind into coarse bits but not a clean cut as in steel cut oats. As a result, my coarse oats absorbed all of the scald water which made the final dough very wet necessitating the addition of more flour to balance things out. I didn't stop with the addition of more flour…I found myself compelled to add roasted walnut oil and some maple sugar to the bowl so what started out as a lean loaf turned into an enriched one but the resulting loaves were beauties. Anyway, you have given me a fun project and for that I thank you for taking the time to share here. Janet, I was wondering about how coarsely ground groats would compare to the steal cut in this formula. The fact that they absorbed all of the water seems to be something that can be adjusted for by shortening the scald period, no? I am not sure if a shorter time would decrease the amount absorbed - probably would but then the oats might be a bit crunchy. What I did for loaf #2 today was to leave the groats whole. They didn't absorb all of the water so that is the route I will use in the future too. I shall try to bake this over the weekend. Our Plain flour in the UK has not a lot of protein in it, so not good for baking bread with, could I use bread flour instead? I found this quite a wet dough. I made it in my kitchen aid mixer, but added the oats by hand. Next time, I will do them in the mixer as well. The recipe mentions to add the oats on a wet surface. I was not sure what that meant, but sprayed the counter top with water from a spray bottle a few times. I ended up having to add some flour as dough was quite sticky, all over my hands . My sourdough starter refresh, rose nicely overnight. After I left the dough for 4 hours not much had happened, I know my kitchen is a bit cold at 68, so I put the dough near the back kitchen door on the floor near a draft, a bit cooler again, and left it overnight. It then had doubled for sure!. I shaped it, let it rise over 3 hours, before baking. I scored it. I did not preheat the cast iron (I have done so in the past, with other breads, but I do not like the really thick crust you often get on the bottom of the loaf). I just removed the lids and you cannot really see a deep score line, more of a light scar and dough spread, there appeared to be good oven spring, it had lightly browned and now I am just awaiting the final bake before removing from oven. Your loaves looked so amazing, I had to try it. Here is the loaf in the crock pot insert rising. I had floured the bottom of the parchment, would not do so next time . I scraped it all off the baked loaf. The two loaves baked. THey seem light, Just waiting to cut into them. They are crackling as they cool. Nice product. I hope they taste as good as they look. I want to make this tonight/tomorrow and I am hoping someone can tell me what this means. "Refresh 100% starter to yield +200 grams for the next morning. Overnight room temps can be 60F. 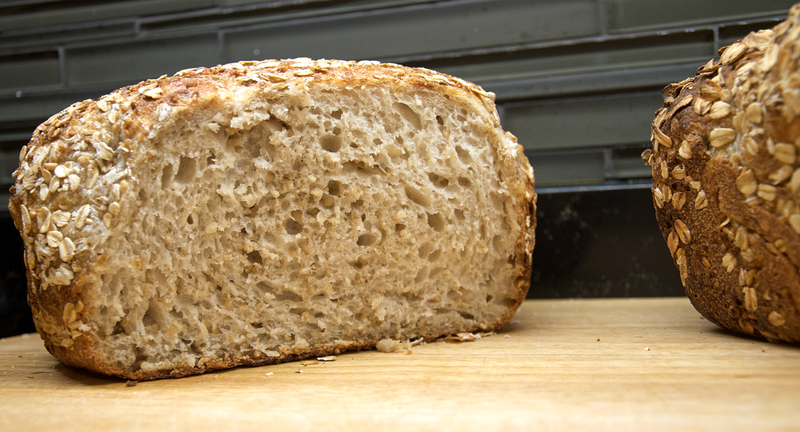 Use 50 gm whole wheat, 50 gm AP, 100 gm H2O and 30 gm natural leaven at 100% hydration." Does "30 gm natural leaven" mean current starter? So I would take 50gm wheat, 50g ap, 100 water and 30 gm starter? 30gm of starter does not seem like very much. 230 g of it or build a levain using 30 g of starter to get to 230 g. I would usually do a 3 stage build using 10 g of stiff rye starter to get there but anything works. So "30 gm of natural leaven"
So "30 gm of natural leaven" IS my current starter? And when I go to use it in the recipe I should have 230gm of starter? Sorry I am kinda new at this and it is confusing to me. take 30 gm of your current starter. Add it to 100 gm water and 100 gm flour and let it proof to yield 230 gm refreshed starter. I just finished this recipe. My bread turned out pretty good. Nice crust, soft texture, nice taste. It was a bit challenging at the end. My dough doubled in 3 hours. It was very sticky. I cut it in 2 and moved it with my scraper to get some sort of round shape. I had just bought a 3qt dutch oven yesterday and wanted to try it. I was worried it would be too big for the DO but it worked. The other half I was going to do just on a pan but I wanted some height to it and at the last minute I put it in a loaf pan. It was really too much dough for the pan. I had visions of this wild dough flowing down all over my oven so I sat and watched it awhile with a pan in my hand to be ready to catch it. But it was very stable and rose big and tall though a little lop sided because of they trouble I had getting it in the pan to begin with. I tried to score this bread before baking but it didn't work at all. I think the oat were in my way. It has a nice mild flavor. Next time I may cut this recipe in half. I am not sure what made it so slack. I measured everything exactly. I forgot I have photos. I did get a little dark on the loaf shape since it was hanging out over the pan.